Shawn Porter was crowned WBC welterweight world champion after out-pointing Danny Garcia in a sizzling New York showdown for the vacant title. 'Showtime' made a cautious start but eventually produced the high-speed, slick attacks expected and unsettled the former holder of the green belt to get the scores of 116-112 115-113 115-113 at the Barclays Center, Brooklyn. The unanimous decision suggested it was wider than it was, but as soon as he was handed the belt, Porter happily went face to face with IBF champion Errol Spence Jr, who got in the ring to call for a unification fight next. Porter agreed immediately, but Garcia is likely to demand a rematch and aim to improve on an impressive performance, in which he began brilliantly. Single shots from 'Swift', particular the overhand right, caught his opponent and everyone's eye early on, the familiar mauling attacks from Porter failing to fire, never denting the confidence of the pre-fight favourite from Philadelphia. It took four rounds for 'Showtime' to get into gear but from then on in, he was darting in, happy to lead with the head - if not the jab - with his own right causing his opponent all sorts of problems. The fifth and sixth rounds were typical of the entire fight, Porter pouring forward and landing combinations, Garcia standing his ground and showing his single shots and short work, with both fighters getting stern words from their fathers in the corner. In the seventh, Garcia seemed a little flustered by the ferocity of Porter's approach and with the latter throwing over 100 more punches by then, quantity seemed to be edging it over quality. 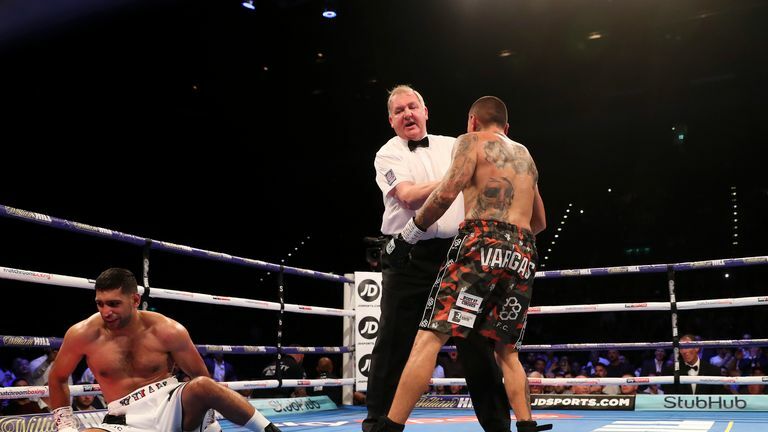 Angel Garcia urged his son to get back to using his right and in the eighth he did just that, adding some rapid combinations that suggested he had finally come to terms with the pace of an enthralling encounter. The ninth saw them battle it out on the inside for a large chunk of it as Garcia again landed the cleaner shots, but the 10th round was easily the best of the night, Porter charging in from the start to land three left hooks in quick succession and the pair then trading combinations until the end, with neither willing to concede. Sensing it was in his grasp, Porter's wild raids had his man on the run in the 11th round but even then, 'Swift' picked him off more than once, determined to remain as calm as possible, with the chance to reclaim the belt he lost to Keith Thurman in March 2017 well within his grasp. Porter, though, had been a world champion since losing the IBF version to Kell Brook four years ago and bit the gumshield down for one final flourish, going for it in what many thought would be the final and decisive round. His left-right combination stood out as the non-stop onslaughts came to an end, with both Porter and Garcia almost done and locked in another inside brawl as the final bell went. A star-studded Brooklyn crowd including Spence Jr, Thurman, Mikey Garcia, Gervonta Davis, Jarrett Hurd, the Charlo twins, Jermell and Jermall, Claressa Shields and the roundly-booed Adrien Broner were all left impressed.